Thirlestane Castle is one of the most magnificent wedding venues in the Scottish Borders, set in beautiful parklands close to Lauder, just south of Edinburgh. With its romantic façade and elegant interiors, it’s the perfect choice for a country wedding. The home of the Maitland family, Thirlestane Castle is one of the oldest castles in Scotland, and steeped in Borders history. The main hall and front esplanade are ideal for a champagne reception. The sumptuous drawing room, with its rich plasterwork ceilings, makes a magical backdrop for a wedding ceremony of up to 100 guests, or dinner for up to 70 guests. Marquees in the Rose Garden, looking onto the oldest part of the Castle, are perfect for evening celebrations with larger guest numbers. 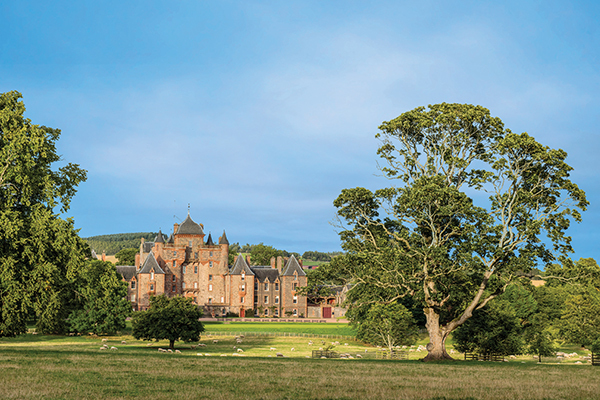 Thirlestane Castle also has a gorgeous self-catering apartment with exceptional parkland views for wedding preparations or the wedding night itself. Parking space is generous, and can even accommodate a helicopter or balloon!